Since trading of voluntary carbon offsets first took off in the late 2000’s, voluntary carbon projects have helped to reduce, sequester, or avoid over 435.7 MtCO2e–equivalent to not consuming over one billion barrels of oil. These projects are supported by companies, individuals and governments purchasing carbon offsets, whose growing demand resulted in a record-high of 42.8 MtCO2e retired in 2018. Yet the carbon markets landscape is changing fast. 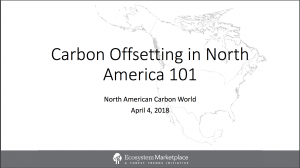 New compliance markets, in the form of domestic carbon pricing schemes, international trading through the Paris Agreement, or the international airline industry’s CORSIA program, may generate unprecedented levels of demand for carbon offsets. How those markets are designed and implemented will determine whether voluntary carbon markets thrive, adapt, or diminish. Key findings from the last decade of voluntary carbon project activity. New insights about 2018 first-quarter trends of voluntary carbon offset issuances, transactions, and retirements. Upcoming policy decisions that might radically change the voluntary carbon markets in upcoming years – including an extended analysis of CORSIA. UPDATE – April 16, 2019: We found an error in our analysis, and made slight modifications to the 2018 Q1 retirements data and total issuance volume over time. Creating high-quality reports takes time and resources. As a not-for-profit organization, our ability to track and analyze voluntary carbon markets is made possible by the support we receive from individuals, sponsors, and our donors. If you value this report, please DONATE HERE and specify Support for Ecosystem Marketplace in the “Comments” input box. If you would like to discuss potential partnerships on our future carbon market research, or would like high-quality images of the report figures, please email Kelley Hamrick. 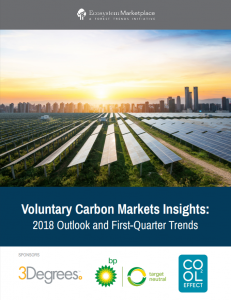 2018 Outlook and First-Quarter Trends of the Voluntary Carbon Markets We presented the latest data around offset issuances, transactions, and retirements, and we will talk about some of the biggest trends coming up in the voluntary carbon markets. A recording of the webinar is available here. Author Kelley Hamrick presented our latest findings about voluntary offsetting in the airline industry and how it relates CORSIA in a webinar hosted by the Climate Action Reserve. A recording of the webinar is available here. The below names are individuals and organizations who have provided support for this report. Note, supporters who have requested anonymity are not included here.